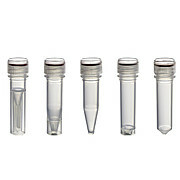 PHENIX Research offers a comprehensive assorment of screwcap tubes to ranging from 0.5 mls to 5.0 mls and are available as sterile and non-sterile. Clear Screw Caps with O-Rings, 500/Bag. For use with SCS line of screwcap tubes only.